Sadio Mane opened the scoring for Liverpool in their clash against Bournemouth this afternoon, as the winger scored a fine headed goal to give the Reds the lead in the first half. Jurgen Klopp’s side are in need of a win today to create a three-point gap at the top of the table over rivals Man City, and Mane’s goal has given the Merseyside club a great chance of doing so. 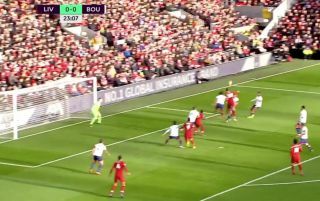 The goal came after a cross into the box from James Milner met the head of Mane, who powered home his effort to give the home side a 1-0 lead. You can check out the goal below. Sublime header from the Senegalese international.